Aging is a gift that we receive with life—and in New Aging, the architect Matthias Hollwich outlines smart, simple ideas to help us experience it that way. New Aging invites us to take everything we associate with aging—the loss of freedom and vitality, the cold and sterile nursing homes, the boredom—and throw it out the window. As an architect, Matthias Hollwich is devoted to finding ways in which we can shape our living spaces and communities to make aging a graceful and fulfilling aspect of our lives. Now he has distilled his research into a collection of simple, visionary principles—brought to life with bright, colorful illustrations—that will inspire you to think creatively about how you can change your habits and environments to suit your evolving needs as you age. 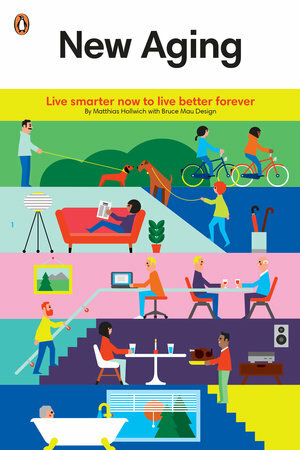 With advice ranging from practical design tips for making your home safer and more comfortable to thought-provoking ideas on how we work, relax, and interact with our neighbors, and even how we eat, New Aging will inspire you and your loved ones to live smarter today so you can live better tomorrow. Learn more about the book here.